This commission portrays the client’s Dungeons and Dragons characters. The story goes that the warrior Gritt and her companions set out to aid the other heroes of the story. Upon setting out the party was trapped in a magical globe by an evil witch, doomed to wander an endless blizzard. Contest entry for a promotional art contest for the new Aquaman movie featuring Jason Momoa. Painting process time-lapse video. Music is Venice Venture by the DJ. Big Wild. Contest entries for a promotional art contest for the new Fantastic Beasts Crimes of Grindelwald movie. Painting process time-lapse video. Music is from the movie soundtrack and is by the talented James Newton Howard. This commission pair is a gift for the new beautiful Dingess bride and groom. They have unfortunately both lost a beloved parent and miss them dearly. 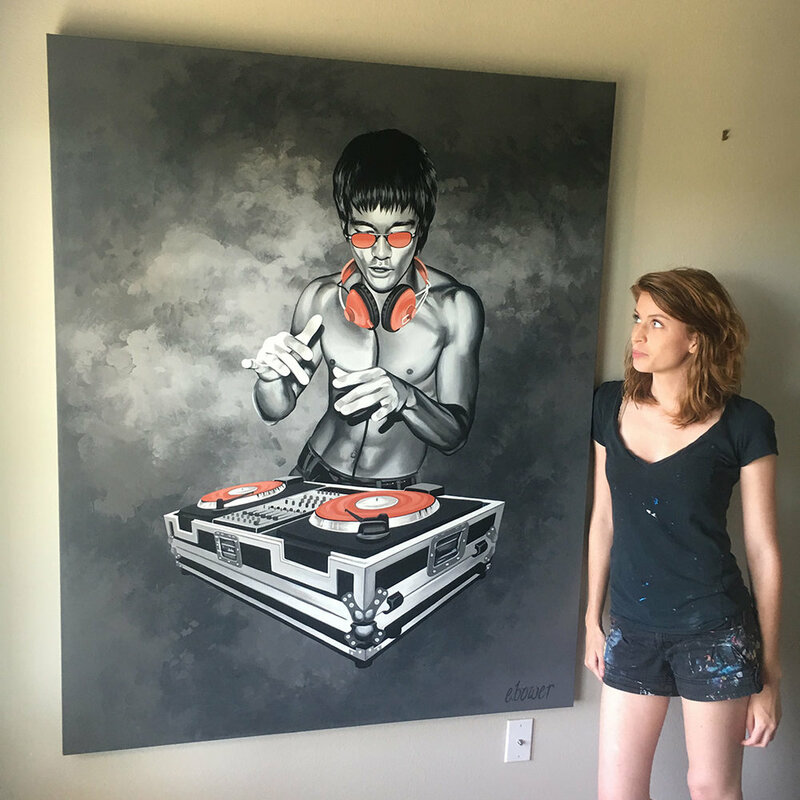 This commission currently hangs in the recently opened Artists Rosso Market on South Lamar in Austin Texas. This commission was a birthday present for Cynthia who is the wonderful grandmother featured in the middle of the painting. 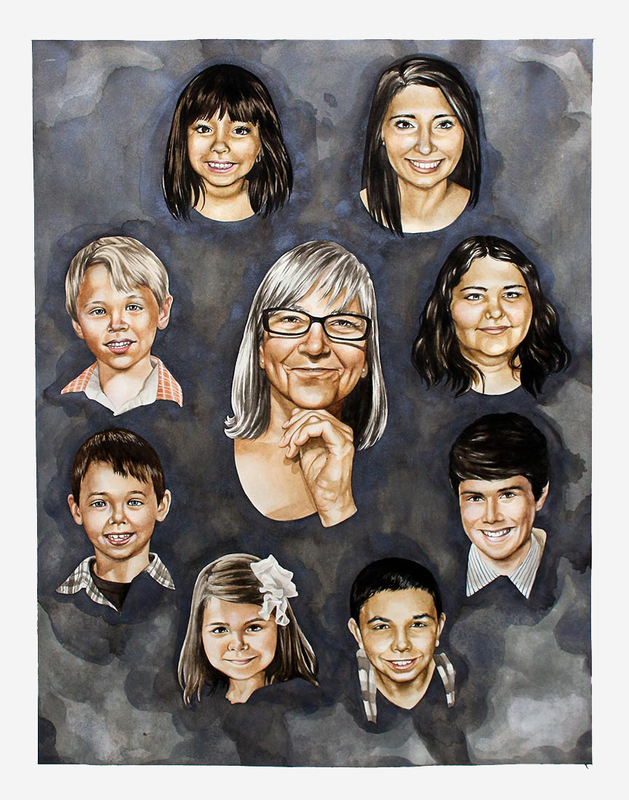 She is surrounded by her eight grandchildren who encircle her in order of descending age. This newly married couple celebrated their special day in New Orleans Louisiana. This painting was done from one of their wedding photos that was taken in front of a beautiful gold mirror. The painting also captures some of the wedding party in the reflection. Engagement photo of the new husband and wife Brigitte and Derek. They start their life together with their beautiful new baby boy. A portrait of Toffee as an adorable Corgi person sitting in front of her mom's rose bushes. Live painting event for a Truven IBM booth. The event was at a recent healthcare convention at the Austin Convention Center. The painting was finished within the convention time frame. A commission of Kaya and Indie, two cats owned by a friend of mine. They are shown as if they are people having a picnic in the park. Bob Bustlet is a former owner of the new Green Pastures restaurant soon to open in Austin Texas. His portrait hangs alongside the original owners of the house. The No Comply Skate shop is located on 12th street in downtown Austin Tx. This watercolor painting was done to commemorate the 10th anniversary of the shop. This commission was a christmas present for the new owners of this adorable little Yorkie Sevro. A newly engaged couple; this commission was actually ordered by the groom's mother that received a portrait of her and her husband on their wedding day 30 years ago. Jazmine is an adorable Pit bull rescue and her mom Heather loves her flower Leigh portrait. This portrait was done in honor of Daniel who passed away at the start of 2016. He and his girlfriend had been dating for 3 years until his tragic car accident. Rest in peace Daniel Greer.